Dr. Samir Jani, MD, MPH is a board-certified anesthesiologist and chronic pain management specialist. A New Jersey native, Dr. Jani completed his anesthesiology residency at Beth Israel Deaconess Medical Center/Harvard Medical School in Boston, MA. It was during this time he was first exposed and drawn to pain medicine dedicating part of his residency learning from leaders in the field. 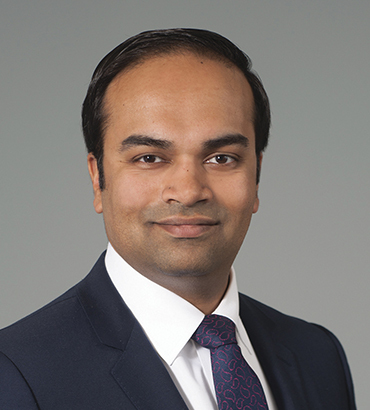 He is a graduate of the prestigious Tri-Institute Pain Fellowship training at three of the nation’s top hospitals (New York Presbyterian Hospital/Weill Cornell Medical Center – top 10 US News and World Report hospital, Memorial Sloan Kettering Cancer Center – top cancer center in the United States, and Hospital for Special Surgery – top orthopedic and rheumatologic hospital in the United States). This training offered a broad experience utilizing the latest methods to treat various pain syndromes including chronic spine, musculoskeletal, and cancer associated pain. Dr. Jani has published multiple peer reviewed articles – many on improving the safety of providing anesthesia in an office. He has also written book chapters on interventional techniques to treat pain. In addition, he has presented his original research at scientific meetings around the country and has been an invited speaker at several medical schools to educate other doctors on pain management. Dr. Jani is a member of the American Society of Anesthesiologists previously serving on the National Committee for Patient Safety and Education for several years. The goal of this committee is to make every patient’s interaction with the healthcare system a safer and more informed one. This is a practice he actively engages in with every patient. He is also an active member of the American Society of Interventional Pain Physicians. Pain is one of the most common reasons a patient goes to see a doctor but often this is dismissed or under treated. Dr. Jani’s philosophy is to optimize pain control using a multi-modal approach in order to improve functional ability and ultimately getting patients back to their lives. This care is delivered with the utmost compassion with the primary focus on creating an individual care plan with, not for, each patient.